We’ve got the best Mobile Game Truck in Pinehurst, Lee County, Moore County, Scotland County and Montgomery County… and we’ve got even more to offer! Have a combination party with our mobile video game truck and Laser Tag! North Carolina’s most exciting Laser Tag party ever! Backyard Laser Tag is AWESOME! Kids love team sports, a challenge, role playing and video game scenarios. 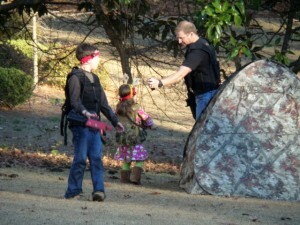 Backyard Laser Tag puts it all together and creates the ultimate experience! The 14 foot” bunker” features army paraphernalia on the walls and ceiling, coin flooring, colored LED shadow boxes for The Laser Taggers, camouflage netting on the ceiling and army style (ammo box) seating so feel free to bring bottled water and light snacks for the troops! 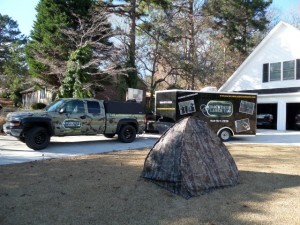 Inside the Laser Tag Trailer, the recruits will put on their Camouflage Face Paint, Special Ops Vests and receive instructions on the use of the Taggers from the Referee/Drill Sergeant. Then it’s time for a short briefing on our High Definition TV from “Sergeant B.L.T.”. It’s a silly, interactive video that goes over the rules of safe play. After theinstructions, they’ll exit the Bunker as fully-trained privates and battle it out for fun, challenge and bragging rights! Book a COMBO party with Laser Tag & Gaming! 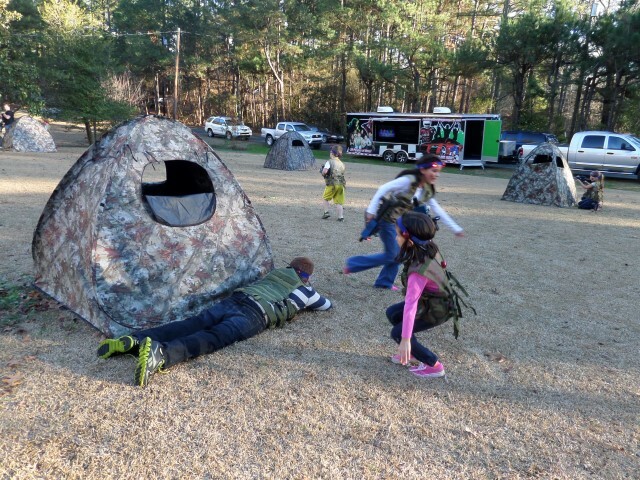 The Laser Tag Field is set up with a variety of pop up bunkers. The bunkers enable the players to take cover or shoot through the openings. The referee keeps the battleground challenging and fun by playing Game Modes such as Free for All, Capture the Flag, Zombies, Captain, VIP, Adults vs. Kids, Invasion, Dodge Ball, Headquarters, Builder and Search and Destroy among others. Many of these games involve realistic props or our Game Box which is a Kindle Fire programmed to be a part of the objective. Each weapon battle mode includes programmable Fire Rates, Clips, Health, Damage and Team Settings. The Taggers weigh about two pounds and feature two Ultra bright Hit LEDs and Sensors designed for bright sun or night play. We can bring Laser Tag, too! The referee can enable “auto-spawn” to allow players to rejoin the game after a set amount of time or immediately, the players go to their “Team Re-Spawn Station” and hit the button to re-spawn and get back into the action! The referee can also turn on “Ammo Mode” to collect the ammunition of opponents after scoring a “hit.” They can disable friendly fire or even add ammo to a struggling player if needed. Most games are team oriented with a mission that is explained by the Referee. If the “Recruits” get tired, hungry or thirsty, no worries…they can take a break in our climate-controlled Army Bunker and enjoy some shade with heat and air! With Backyard Laser Tag, you only have to pretend to be tough! Let our Drill Sergeant take care of the party while you sit back and watch the fun! 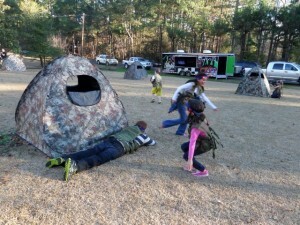 $499 for a 3-hour Combo (Mobile Video Game Theater/Laser Tag) Party! Please visit our Backyard Laser Tag website for more information and to download invitations/waivers for your Laser Tag guests. A signed waiver is required for players to participate. If you requested mailed invitations they will be sent as soon as you have paid for your booking. The invitations have a waiver printed on them as well.